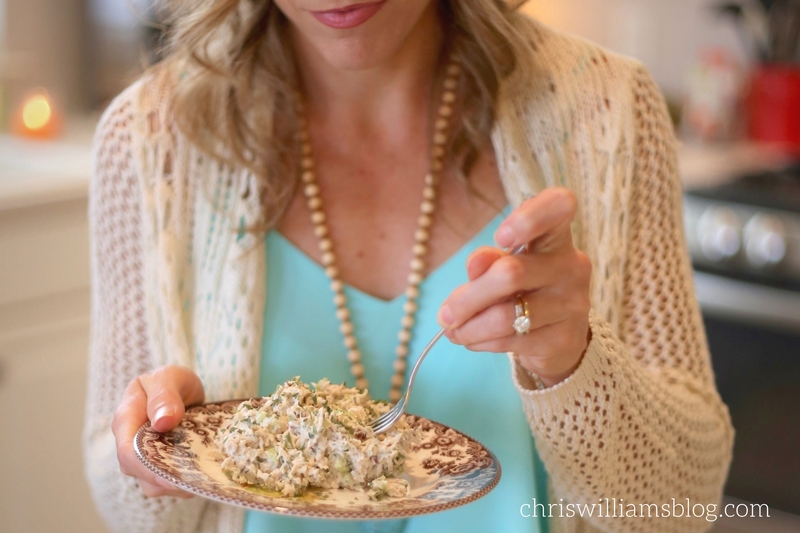 Only in the South can a woman be saved over chicken salad, but that is how my story begins. I was 32 years old when I was invited by a friend to join a Bible study. It was my first one, and I was excited about the invitation. As I sat there surrounded by precious women, I instantly felt a welcoming presence. It was not long after my arrival I had one of those defining “light bulb moments” that awoke me from the inside out. The words, “its about a relationship not a religion,” pierced me. An internal beacon awoke upon hearing that phrase and the realization that I did not have a genuine relationship with the Lord had surfaced. Very soon thereafter my Bible study teacher and I met for lunch. She shared with me the gospel, prayed with me and over me. The time had presented itself. Hand in hand at our little table for two in the midst of lunch hour and over our chicken salad, I invited Christ into my life. It was a new day. I had a fresh hope and I was excited about this newfound relationship in my life. Seeking and learning foundational truth in the Word of God became a priority for me. Tuesday morning Bible study became the highlight of my week. I felt at home as well as a sense of accomplishment when learning God’s truth, precepts, and principals for my life. As my knowledge deepened, layers of truth in my own personal walk were began to unfold. The more I studied-the more I knew. And the more I knew -the more I desired to be that picturesque and amazing godly wife, mother, and friend that is so graciously portrayed in the Bible. Yet through all my efforts, hard work, and time spent on learning about the Lord, my wants and desires seemed unreachable. My faith was quickly coming to a stand still and the hope that so filled me at the moment of my salvation was feeling like a distant memory. It was another light bulb moment. I had invited Christ into my life on my own terms, and I was trying in my own efforts to be the one that was in control of our relationship. I had invited Him into my life without truly surrendering my whole heart. The realization and reality of what I had done was undeniable. As the mask came off and the walls around my heart were torn down, my eyes were opened to see brokenness, idols, and sins that were weighing me down. Solemnly, I realized that I knew Jesus as my Savior but didn’t know Him as Lord over all in my life. He had forgiven my sins, yet I never specifically acknowledged all my sins to Him. I had invited Him into my life but did not allow Him access to my entire heart. I wanted His provisions and the best for my loved ones, yet I never placed each of them in His loving hands. My security and identity did not rest solely in Him; therefore, I knew I could not stand before Him naked and unashamed. I saw my need for the cross, and it was a time of total release. I acknowledged all that I was and all that I had now belonged to Him. Gladly surrendering everything to Him—my marriage, our children, our home, future, and very humbly all my heart because it was more than evident that I was not the one that was meant to be in control and that I could do nothing good apart from Him. I promised then and there I would do whatever He called me to do. I would not stop seeking Him until He showed me that I had been completely forgiven and set free from all my self imposed burdens. I begged Him to fill my heart and soul with His love. I prayed for peace, joy, and fulfillment that was pleasing to Him. I confessed I needed the Lord to help me learn who He wanted me to be as well as show me how I can fulfill His plans not only for me but also for my family. It was finally time to release idols, fears, insecurities and burdens that had weighed me down for so long and to heal the brokenness that was in my heart. He graciously heard my prayers, and change quickly began. Swiftly, He drew me in for a glorious season of revival and refreshment by rearranging my schedule, keeping distractions at bay, and providing me with much needed quiet time during this season of reconnection with the Lord. I was at His feet daily. My days started with Him and ended with Him. I was praying, confessing, journaling, and seeking His Word with new eyes and a very delicate and open heart. I was completely dependent on Him for direction, guidance, and clarity in our relationship. I began to experience His presence and hear His soft voice return once again. He and His Word were nourishing my very tired and thirsty soul. Christ became the ultimate healer of my heart, and His Word was medicine to my mind, body, soul and spirit. By coming to the cross to seek repentance; the blood of Christ cleansed and gently washed away my brokenness. He graciously brought me to His table as I dreamt one night of being in His presence. I saw myself climb up onto His lap like a little child does with their father and felt His big arms reach around, hold, and lovingly hug me. It was a sweet moment of healing that had come from heaven above. I prayed wholeheartedly in thanksgiving for Christ’s Lordship in my life and for His unconditional love, forgiveness, and unmerited favor that had been so graciously poured out to me. Completely filled with His love, I was overwhelmed by His presence. As He spoke the words, ‘it is finished’ I knew right then and there that He had answered my prayer. By His grace and in His timing, my salvation had been sealed. Doubts of who I was were completely erased, and I was set free from all my self-imposed burdens. By drawing me close during a time of frustration and confusion, He provided clarity, intimacy, and rest. Through His Word, will, and timing, He revealed Himself in such a beautiful way. My eyes and heart were opened to see the magnitude of His redeeming love, and I am grateful for the blessings that have come from surrendering and placing my heart in His capable hands. There is no more confusion. Only trust in the One who heals and restores. What an amazing testimony! It gave me goosebumps. Thank you so much for sharing.